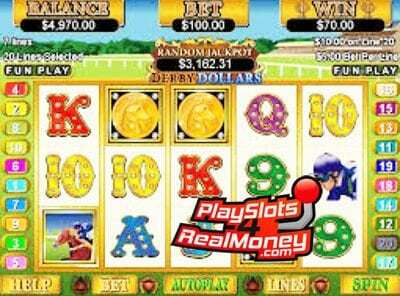 Derby Dollars Slots is a five reel, twenty pay line online video slot machine that powers Real Time Gaming (RTG) software. This horseracing themed game features a progressive jackpot to win plus scatters wins, a multiplier, a free spins feature, and bonus games. I enjoy horse racing betting and playing games online for actual cash. Furthermore, when I heard about the Derby Dollars slot machine, I was excited. However, I began to play the game and was not impressed. Don’t get me wrong; I love the theme. Nevertheless, the graphics were terrible. Most importantly, as a gambler, I look for big progressive jackpots. Luckily, Derby Dollars slots have very nice sized prizes. In contrast, there are other electronic gambling machines with online horse racing betting themes that are better. Gamblers all across the globe can play Derby Dollars at any of the recommended USA online casinos listed on the bottom right-hand side of this review page. Click on our links and our banners to claim your exclusive online slots bonuses that offer free spins gamblers all over the planet. Before you start spinning the reels playing “Derby Dollars” online slots for real money you will need to select the amount you want to bet. This video slot game has an excellent betting range that is suitable for penny slot players and high rollers that play for high stakes. The coin denominations are $0.01, $0.02, $0.05, $0.10, $0.25, $0.50, $1 and $5 per pay line, which makes the minimum amount that you can bet per spin one penny and the maximum one hundred twenty-five dollars. Before we tell you how to win the Derby Dollars progressive jackpot, you should know about the symbols first. Start to turn the Derby Dollars horseracing themed reels you will see poker playing card icons like J, 10, 9, A, K, and the Queen. There are plenty other horseracing themed icons on the reels, and they are the highest paying ones! You will see a pair of binoculars, a trophy, the jockey, a lady, a gold coin and the horse. The progressive jackpot is triggered at random and doesn’t matter if you are betting pennies or playing slots for high limits. The most important icons are the horse, the gold coin, and the Jockey. The horse is the wild, and the gold coin is the scatter. When you land five of the Horse wild symbols, you will win 3333X your triggering wager. If you only land three or four of the Wild Horse icons, it will replace the other symbols to help you form a winning combination.